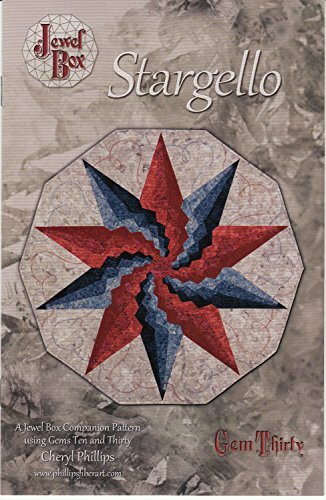 Stargello Quilt Pattern, by Phillips Fiber Art, Finished Size 40'' x 42'' Decagon by Phillips Fiber Art at Designers Artists. MPN: SGP. Hurry! Limited time offer. Offer valid only while supplies last. This pattern, bargello piecing in a star design, is a companion pattern in the Jewel Box series. Simple strip sets are cut, then framed with solid pieces to continue the spiraling effect. This pattern requires the Gem Thirty tool (item #GEM30). This is a pattern, not a finished item. View More In Sewing Patterns. If you have any questions about this product by Phillips Fiber Art, contact us by completing and submitting the form below. If you are looking for a specif part number, please include it with your message.